If you want to make more money, you need to understand the Value Hierarchy. The Value Hierarchy is a simple tool which demonstrates how you can charge more money by systematically adding value in your business environment, taking things to the next level (literally). Before we get started, I know a lot of people are visual learners, so let’s take a look at what the Value Hierarchy actually looks like. The Value Hierarchy is made up of a few different levels. Each level represents an increase in value from the one below, and therefore an increase in potential revenue – the higher you go, the more money you can make. However, as you work your way up through the levels, the barriers to entry also become higher, creation becomes more difficult, and more time, energy, capital, and resources are required. This is the basic level of value. Give people a load of information, and let them dig through it. This is useful on a basic level. It’s nice of you to give people information, but there’s nothing special in that information. Information used to be power. It used to be the thing to have. Twenty years ago, you would have been the boss. Encyclopaedias were killing it. These days though, with Wikipedia, Google, and all the other services on the internet, information is becoming more and more widely available, and so its value is hurtling towards zero. This level of value isn’t good enough for a business anymore. It’s a good first step, but that’s it. You have to have something spectacular that sets you apart, otherwise you’ll simply be commoditized when someone rips off your site, e-book, information product, or even your content word-for-word. If you stay here, you’re dead. You have to move on to the next levels. Examples: Wikipedia, Wiki-anything, TripAdvicsor. Rooftop Bars. Any other random content sites. Resources consist of information which is organized in order to solve problems. Resources are more useful to people because they’re designed to solve problems, and because they’ve been curated. Instead of a never-ending stack of papers on everything to do with a topic, you’re providing the top 5-6 pieces of information, along with the first 2-3 action steps your customers should take in order accomplish goal X. A good example of this is the difference between a site that lists out the history of email marketing & the site that tells you how to use email marketing effectively & lists out the top 5 services for email marketing for both small businesses & enterprise level businesses. Creating resources is part aggregation and part curation. The value is added at the moment when you become the “editor”, and start separating the good information from the bad, making it super easy for your customers to find the information they need in order to achieve their goals. Examples: Paleo Diet Guide. WordPress Theme Directory. How To Start a Blog Guide. Frameworks are what separate content providers from thought leaders. A framework is a way for people to think about a concept, a topic, or multiple ideas, in a systematic way. With frameworks, you take information to the next level, pulling it together into a resource, and then creating a framework for thinking about concepts that you can then apply to other things. For example, you should be able to look at this post, walk away, and apply this type of thinking to your blog, product, business, or any other venture you’re involved in. If you want to find a few other great examples: Dan Andrews is fantastic at putting these together (Tao of Hustle, Rip Pivot Jam, and the 737 Principle). Here’s the thing about frameworks: they’re tough. If you excel at creating these, you’ve pushed through the first big barrier to entry. The first two levels – information and resources – don’t typically have much in the way of barriers to entry, other than a lot of time and some hard work. Frameworks require original thought, a trait that is rarer than you would think. Because of that, they are that much more valuable than resources, which only require research and curation. If you can do this, not only will you be able to set your resources and information apart from the rest, but you’ll also set yourself up as a thought leader, and build yourself a platform from which to launch everything else. I would go so far as to say that the ability to create frameworks sets the successful bloggers apart from everyone else who starts a blog. Examples: Seth Godin, Malcolm Gladwell, Dan Andrews. Meta note: This post is a framework for thinking about the value of various projects, businesses, and tools. Welcome to the world of apps. Tools are simply things to help make you accomplish ideas & projects more efficiently. They also can help you operate within frameworks more effectively or utilize & process information & resources faster. Most of the time, unless you’re a technical guy, or you already have the skills to build an app, you’re much better off starting on one of the three lower levels of value in order to prove and understand your market. Tools tend to take time & energy. Much like Steve Jobs said “computers are a bicycle for your mind”, tools don’t necessarily do the work for you, but they help you do it faster or more efficiently. They’re a “bicycle” for whatever task you’re trying to accomplish. If you’re a master outsourcer & want to outsource this development, you can, but typically unless you’re a software guy, using one of the other three levels to get started is a much better way to work your way up the hierarchy. Examples: Cold Shower Therapy App. SpotHero. Typically, services offer a much higher level of value because they help customers on a service level – usually by doing something for them. In other words – they just want it done for them. They don’t want to have to think. They just want it done & they’re willing to pay for it. Some apps & tools pull double duty by taking things to the next level. Uber does this – you push a button & you’re essentially transported to whatever location you like – on demand. Instead of just helping you do something more efficiently – they actually do it for you. Example: Uber. Paleo Meal Planning Service. Outsourcing. Pick one (or multiple to fill), and then charge accordingly. Great article. I was especially drawn to the figure you have there. Every time someone presents information with a clear graphic, it helps to make it stick that much more. So glad I’ve found your site. I’d like to say my blog is a Level 3, but I could just be flattering myself. Great post! I’m really glad I’ve found this blog. You’re really helpful! Love the graphic. This article makes a strong impression, but the graphic sticks in my mind as a simple way to remember this. Thanks for sharing. 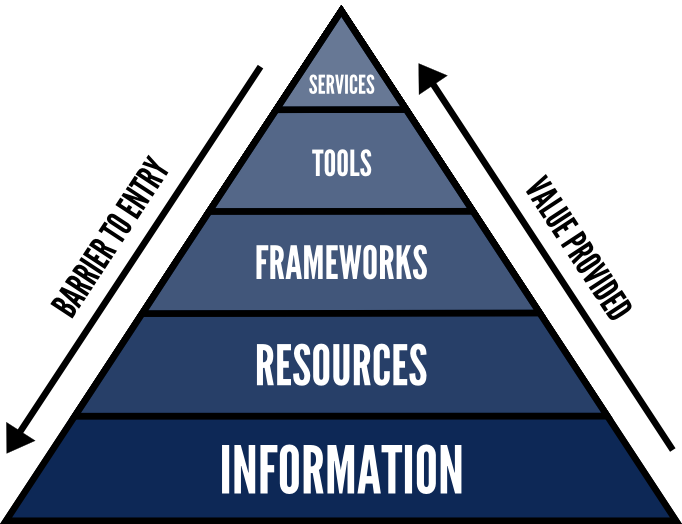 But I think that the “product” is missing, and that it should be on top of this pyramid. Nothing scales better and provides more value than a service turned into a product, especially if this product is subscription-based. Examples: All Google Apps, Mint.com, Airbnb. I’d classify those as “Services” or “tools” depending on however they solve a problem. Mint is a “tool” – google apps is a service. Now this is how you provide content of great value. I am going to adopt this method today! Thanks for this awesome post. I would love to see a follow up post comparing these values with the tasks associated with getting them done. Like a dollar per hour pyramid, maybe employees at the bottom, and CEO at the top. And all the other stuff in between. I’ve seen a few out there, but I think your take would be a sweet one brotha.